In case you haven’t done so yet, click here to find out more about my summer book sale! I started this promotion because many of you asked for signed copies of my books, which you can’t get via Amazon. Right now – only through 31 August – you CAN get signed copies of my PFNAR 2015 lower than Amazon’s price, plus some other good deals to go along with them. Get yours before time runs out. And please subscribe to the blog by using the bar across the top of the screen. Keep in mind that I publish this blog for you for free, and I love doing it. But know that it’s the book and gear sales that help offset the web hosting fees and some of my travel expenses. So now’s a good time for your summer holiday shopping, and a very good time to give back. I truly appreciate it. And if you’ve already ordered, THANK YOU! This week is the last post from my Memorial Day roadtrip. To recap, my husband and I drove to Glenwood Springs first, visited the Glenwood Caverns Adventure Park and the Hotel Denver there, then we moved on to Silver Plume to ride the Georgetown Loop Railroad. 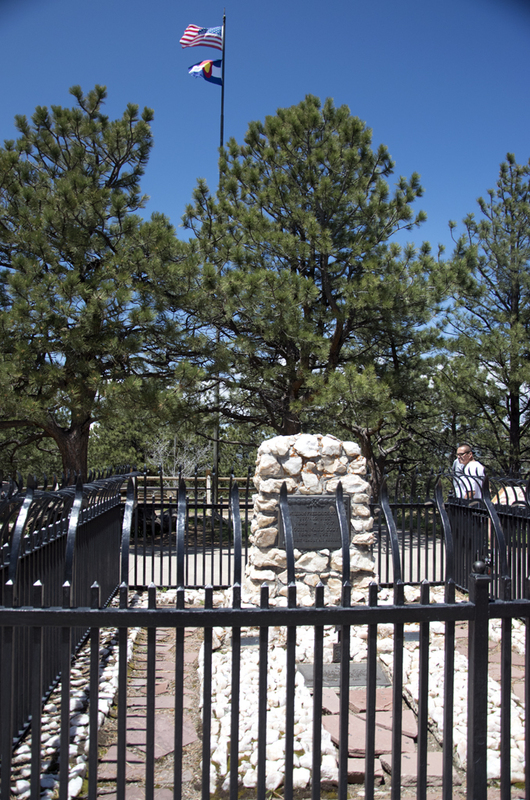 Our last official weekend stop was Buffalo Bill’s Grave on Lookout Mountain. 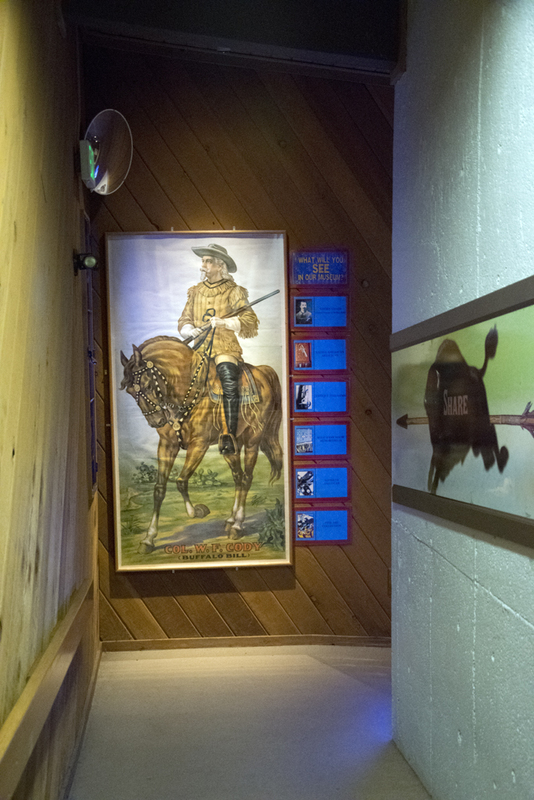 Of course I had heard of Buffalo Bill Cody throughout my life, but I probably couldn’t have told you much about him before visiting the gravesite and museum there. 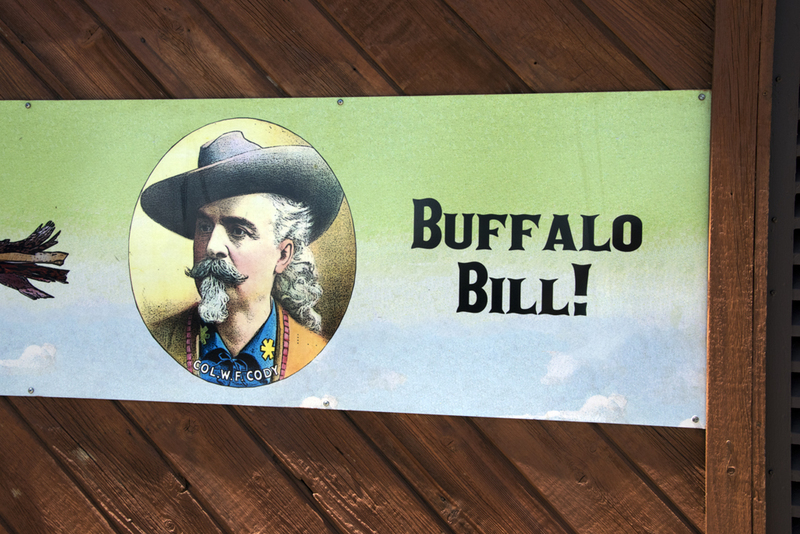 In case you don’t know, Buffalo Bill was born in Iowa in 1846, then his family moved to Kansas. 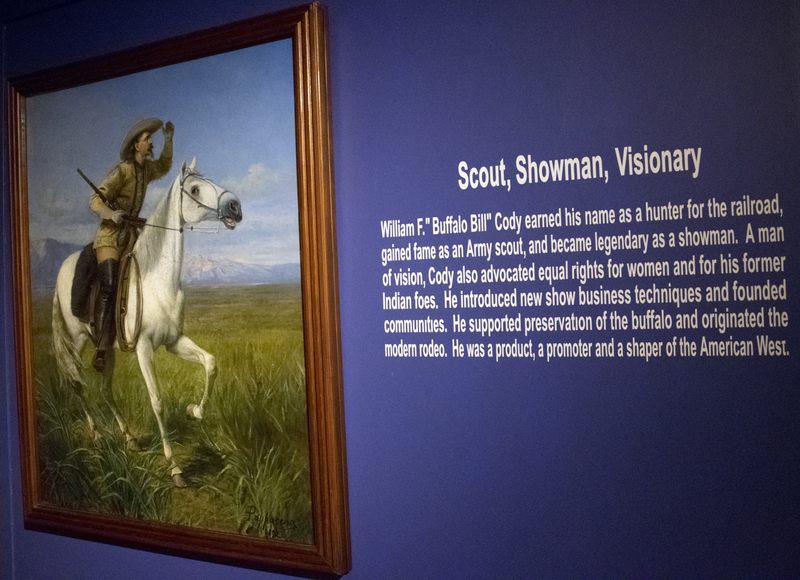 At the age of 11 he left home to herd cattle and drive in a wagon train across the Great Plains multiple times. 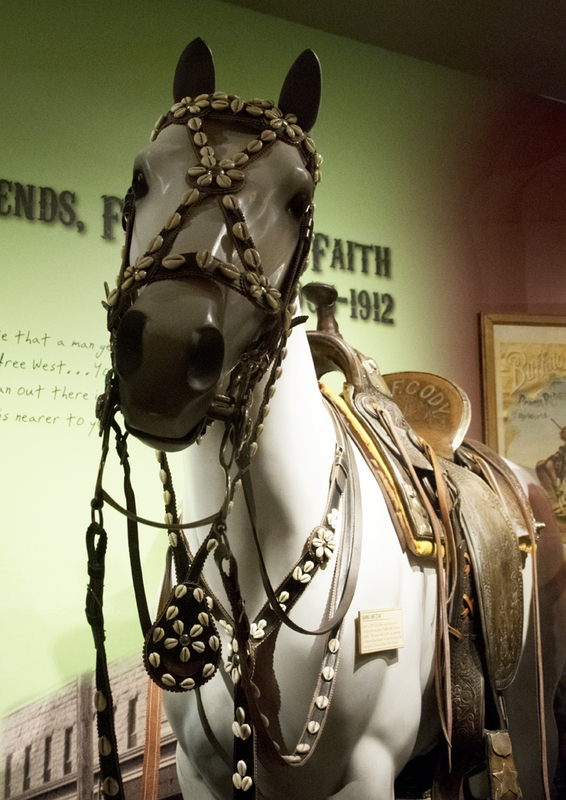 When he was 14 he became a rider for the Pony Express. After the Civil War he worked as a scout for the army. So the dude had street cred as a real cowboy. When he was 26, he began his career as a showman playing a character in a western play in Chicago. 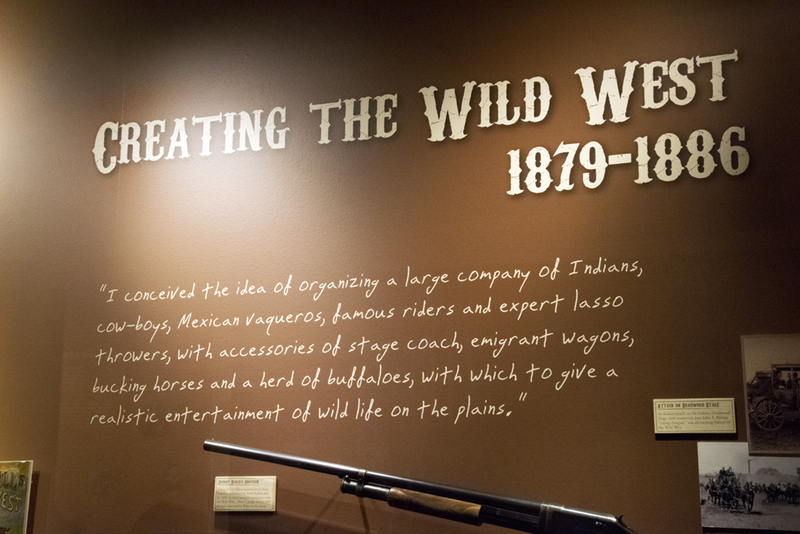 The year after, he organized his own acting troupe with the likes of Wild Bill Hickok on the roster. 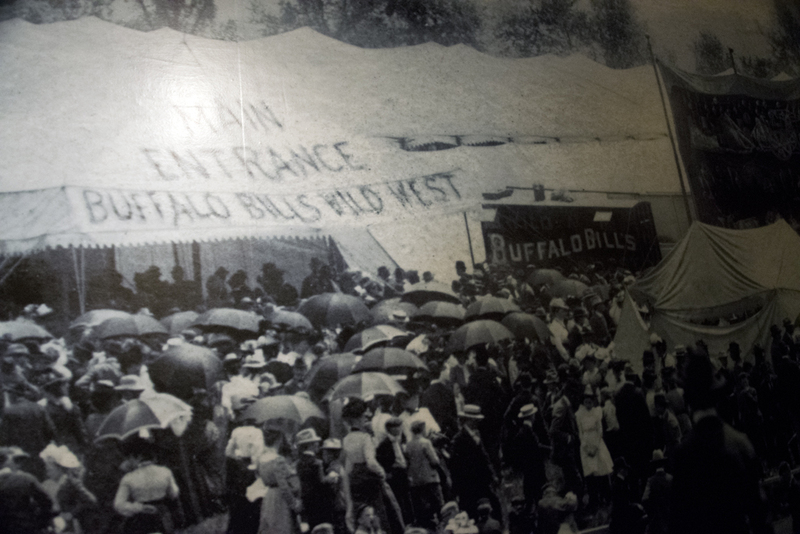 In 1882 he formed his Buffalo Bill Wild West Show, for which he’s most remembered. 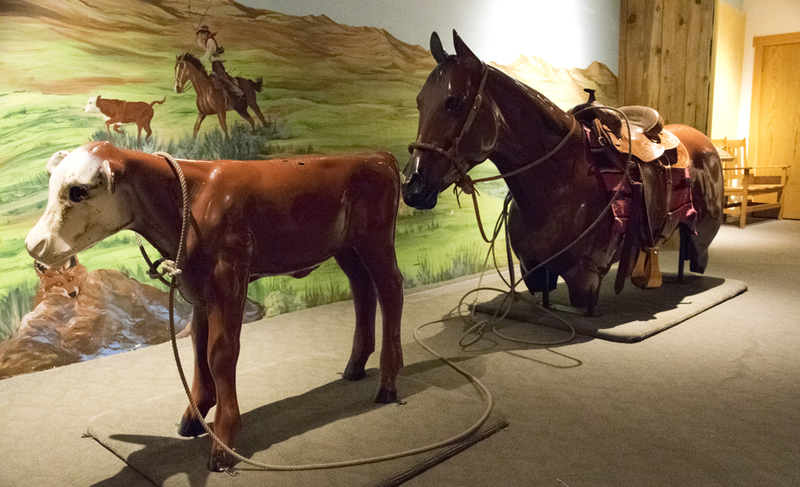 The show was a gigantic traveling affair, with a cast of hundreds of cowboys, cowgirls and Native Americans plus dozens of live buffalo, elk, cattle and other animals. Think about that! 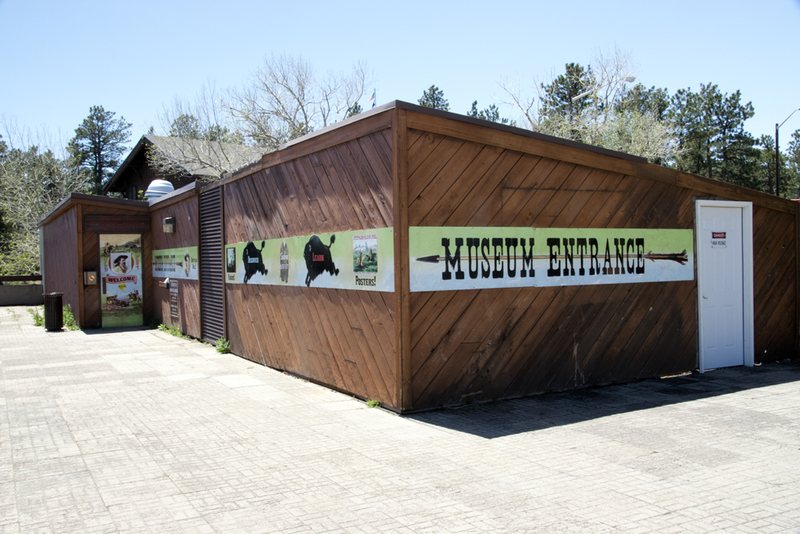 They had tents, rodeo equipment, costumes, tack… it just staggers the imagination! This huge production traveled to all the then-48 states plus DC. What’s even more amazing, he took this enormous entourage abroad and performed in 12 European countries and Canada. They even performed for Queen Victoria! 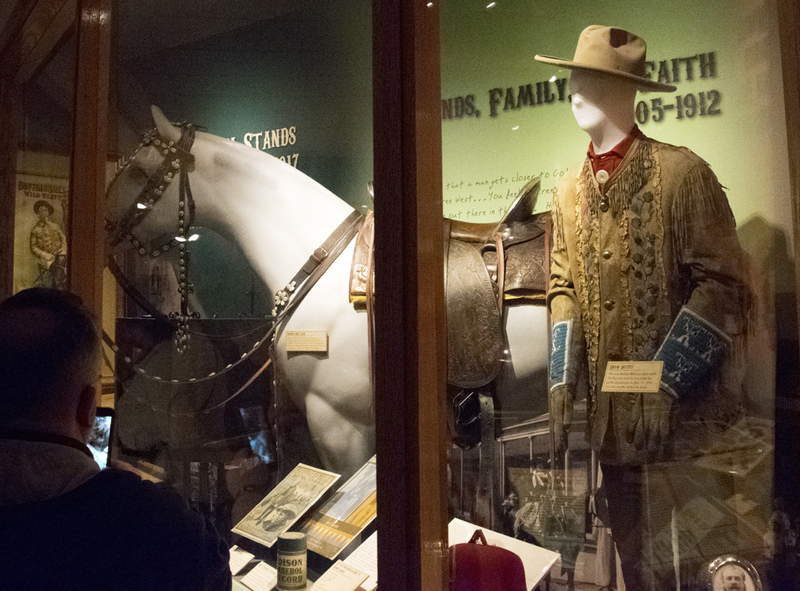 There’s a cool, downloadable pdf on the museum’s website that lists the places Buffalo Bill performed. It’s really interesting to see if he came to your town. Well, this stop on our trip wasn’t planned, but we didn’t want to end our trip, so we stopped there when we saw the signage for Bill’s gravesite. We were on a scenic route called Lariat Loop. 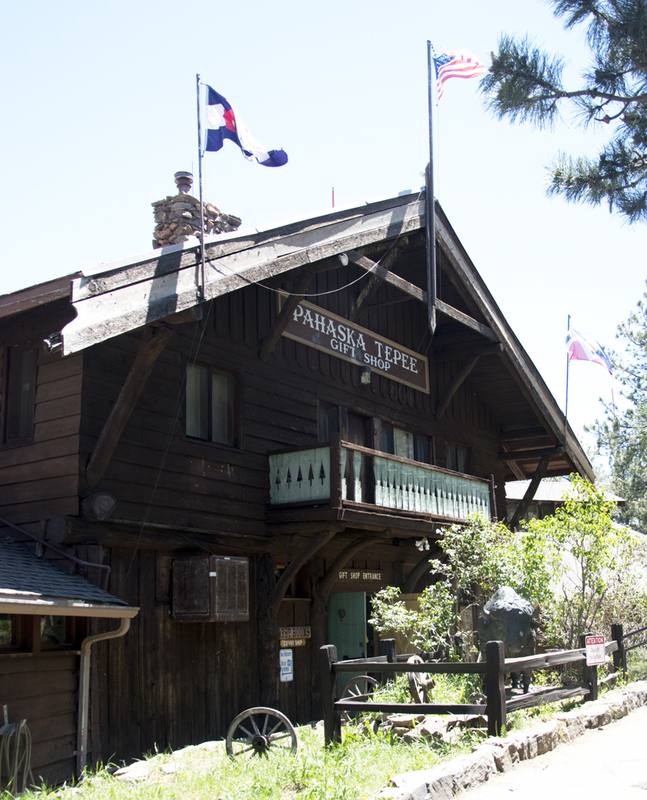 Colorado has 26 such scenic byways that you can plan your roadtrip around. Each one has its own historical and geographical identity. And 11 of them are designated as America’s Byways by the US Department of Transportation. But I digress. The nearest town you can see here is Golden. Just past Golden are the North and South Table Mountains with the highway running between them. That big, warehousey operation between the table mountains is the Coors Brewery. Beyond the table mountains you can see the northern part of Denver (Arvada and Westminster). The downtown skyscrapers are just out of the frame on the right. We live just out of the frame to the left, about 45 minutes away. I think this was a baby because it was pretty small compared to most I’ve seen. Interesting that I’ve seen so many in three months! 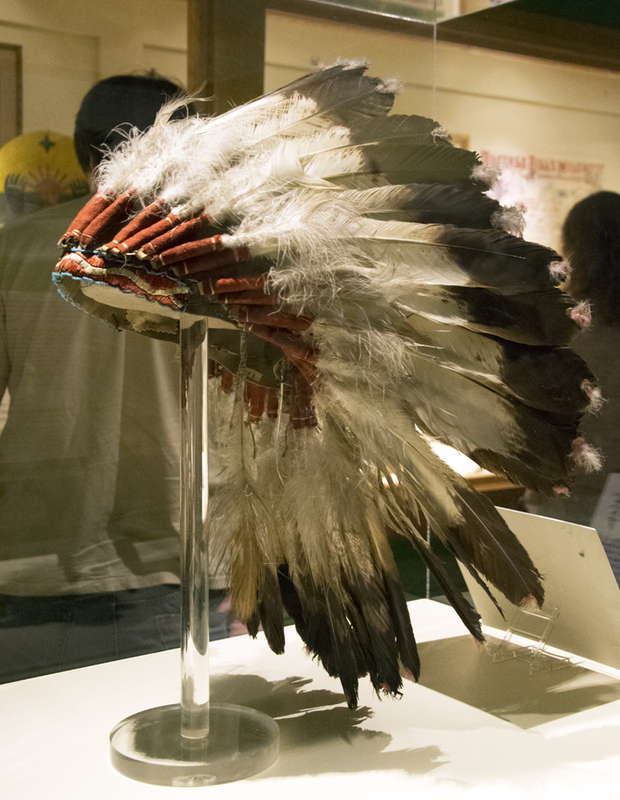 I’ve always wondered how they attached the feathers to the headdresses. Now I know: rawhide, fabric and string. 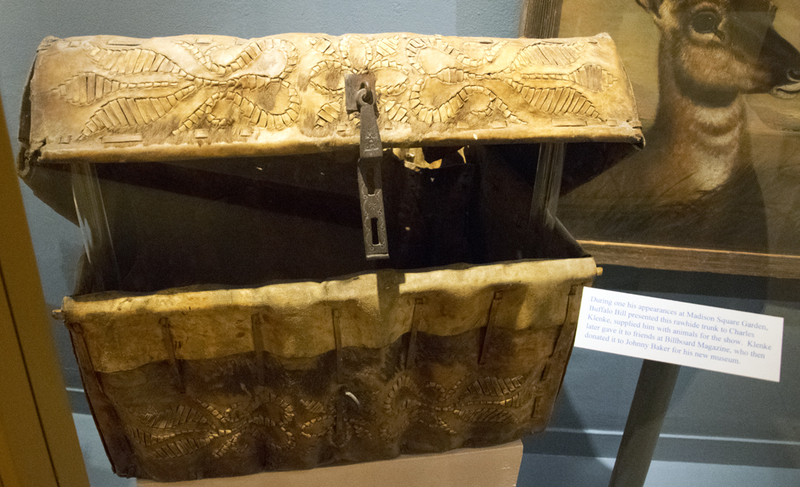 I TOTALLY dig this rawhide chest! 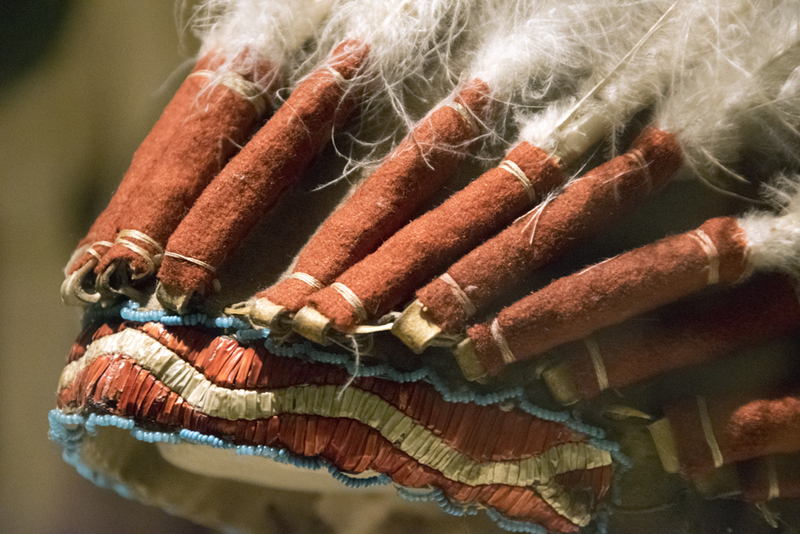 Speaking of creepy, I’ve always thought it was too weird to save someone’s hair, but here’s some strands of Buffalo Bill’s vs. Wild Bill Hickok’s. Go figure. There was even education in the bathroom stalls! “Lavatory Stories”! And, no, I’m NOT curious about the stories in the men’s room! 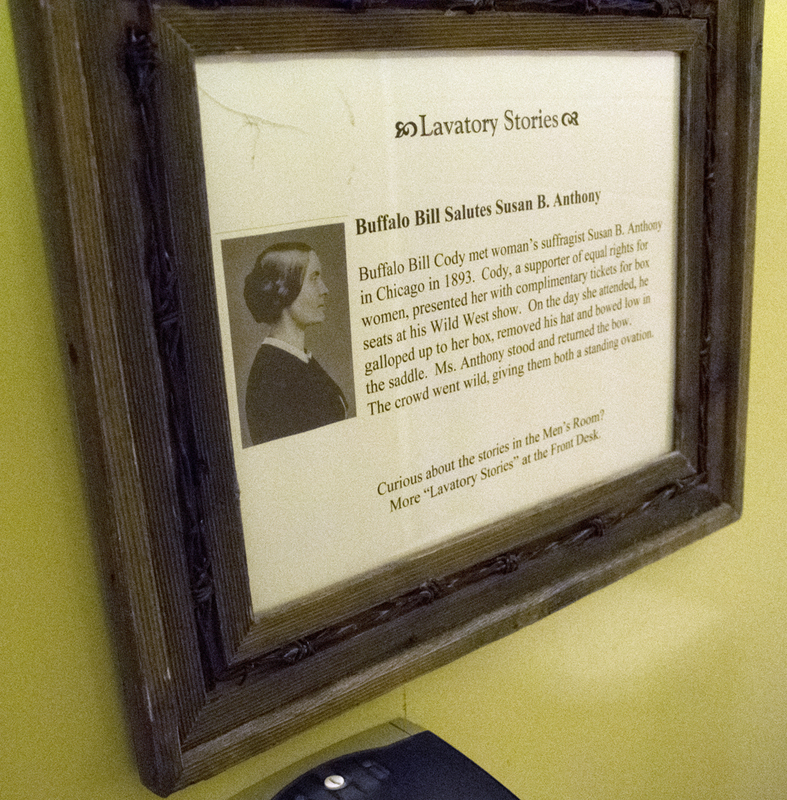 If you read the above photo, you’ll know Buffalo Bill was a proponent of women’s rights. 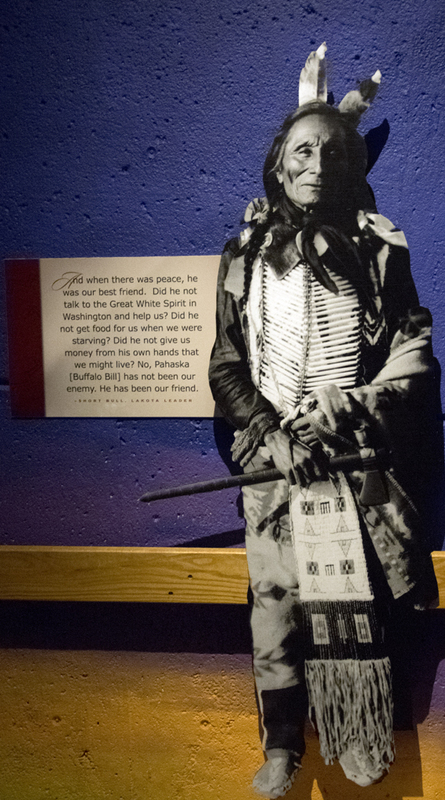 In addition, he respected the Native Americans, too, working for their rights as well. 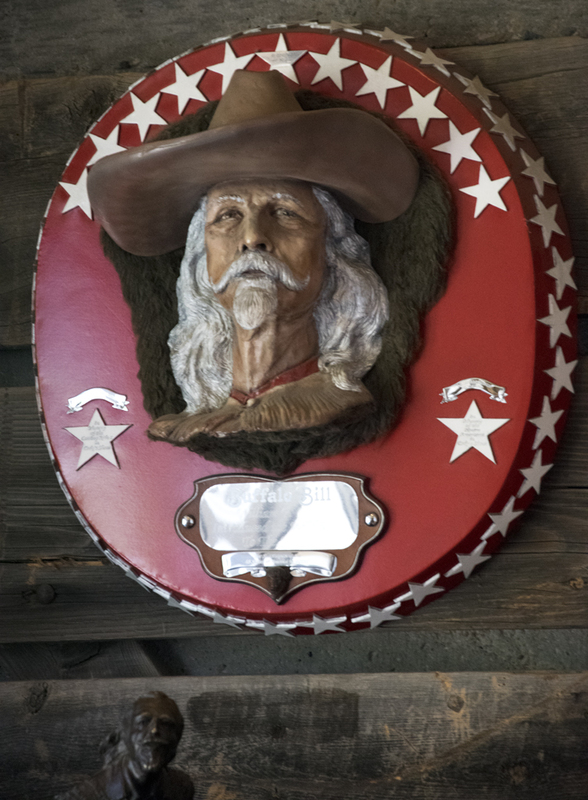 He has come under some criticism because his Wild West Show employed so many Native Americans, and he was accused of exploitation. And I’m sure animal-rights proponents have had their say, too. 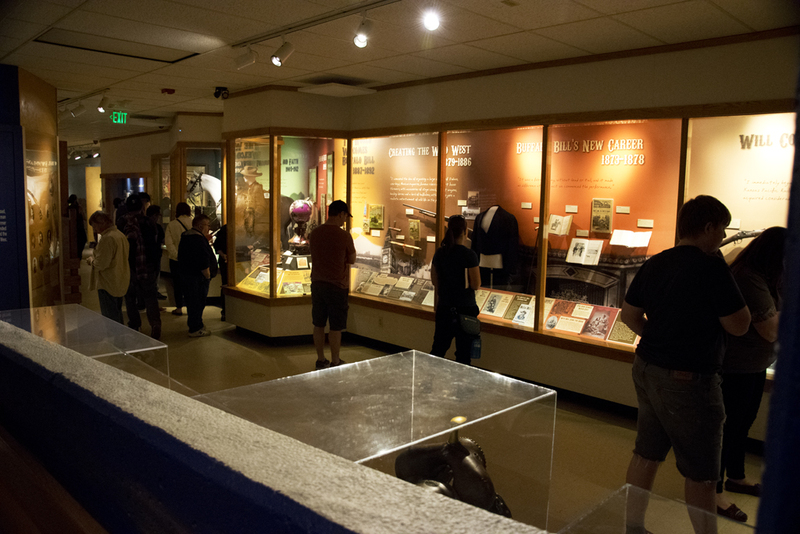 But several displays in the museum provide evidence that he welcomed and respected everyone and just wanted to educate and entertain the masses about life in the West. 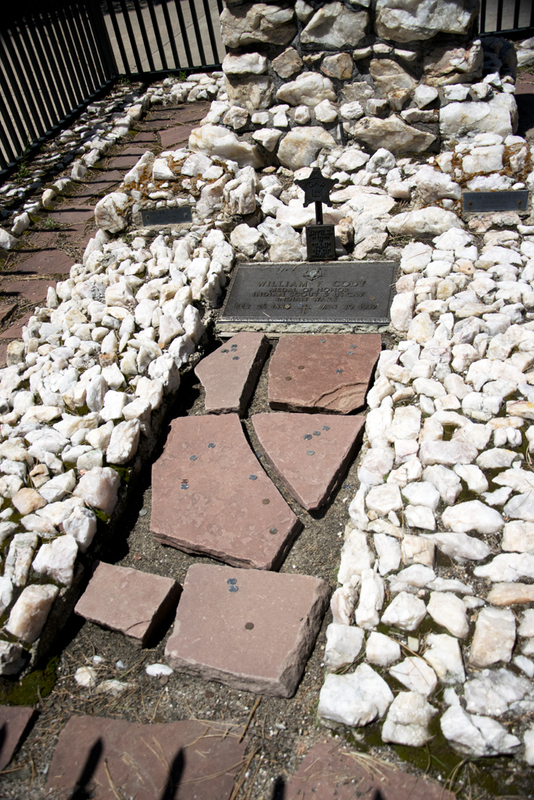 For many years he said he wanted to be buried in Cody, Wyoming. 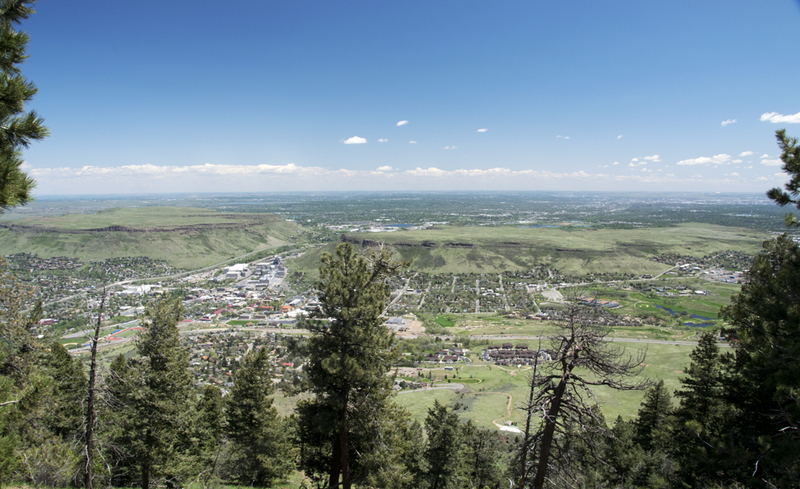 However, near the end of his life, he changed his mind and decided that Lookout Mountain was the place for his grave. The decision was hotly disputed. 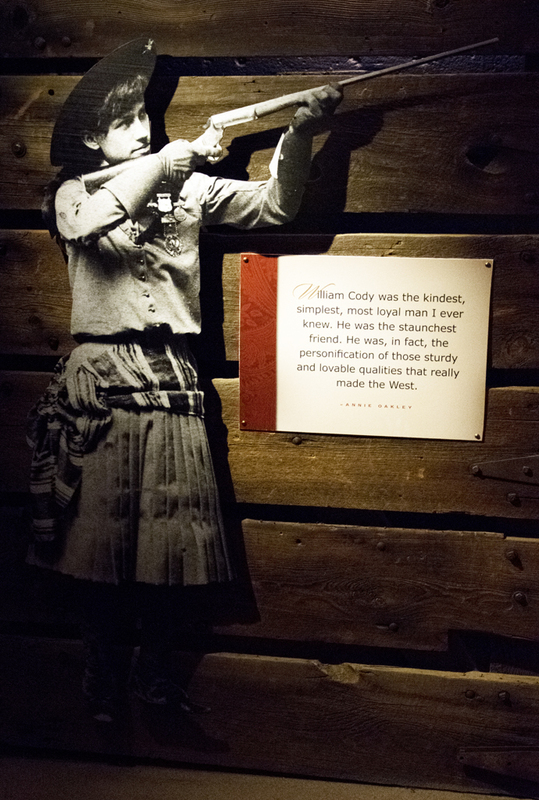 Cody, WY, fought fiercely to get his body and museum because everyone knew it would be an instant tourist destination. But apparently he told his wife, some close friends and the priest that administered his last rites that he wanted to be laid to rest on Lookout Mountain. 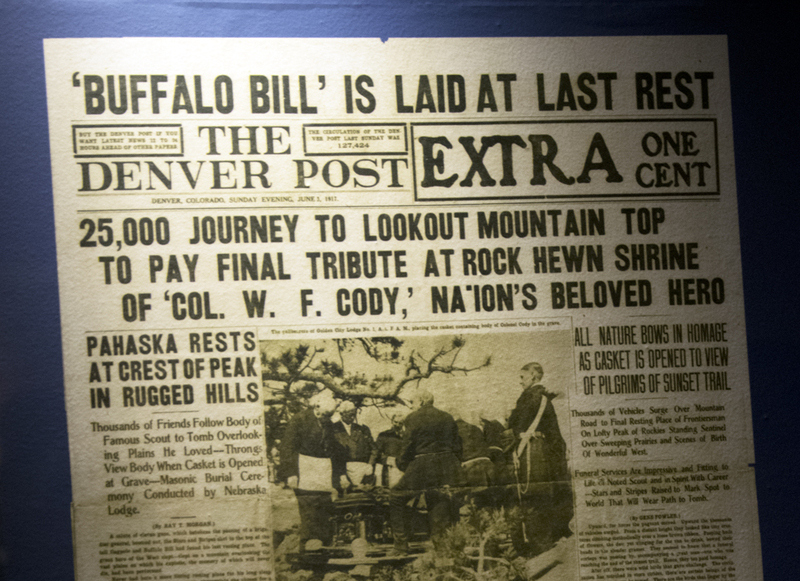 Buffalo Bill died in 1917 while visiting his sister in Denver. 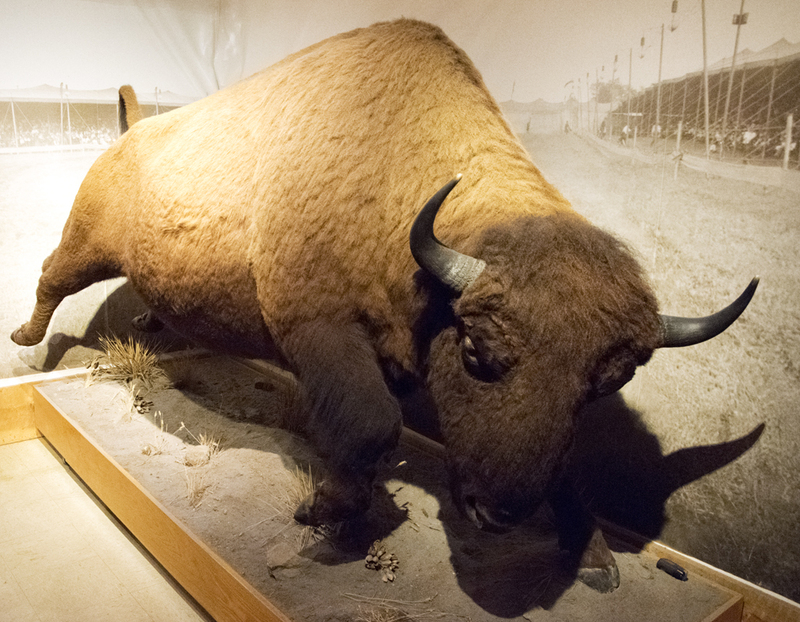 In 1921, Buffalo Bill’s “unofficial foster son” (according to the website), Johnny Baker, started the museum, which is called Pahaska Teepee. Tourist destination is right! 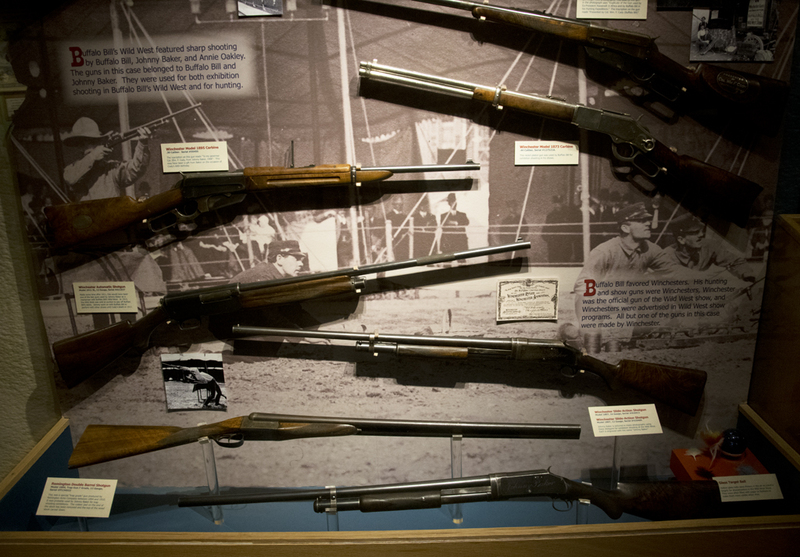 Since its opening, millions have visited the site. 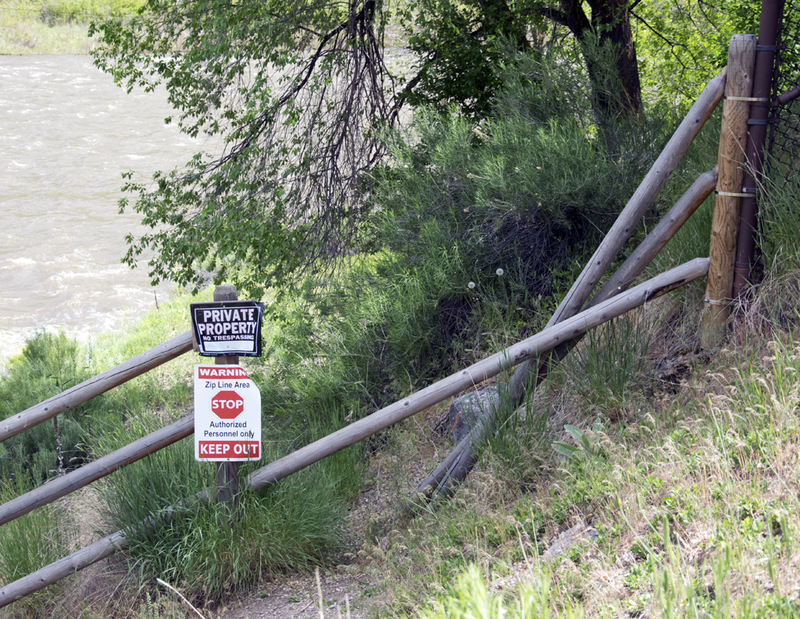 Today it’s owned and run by the City and County of Denver. Touring the museum first, I think, helped me give proper respects to the grave once I got there. It sometimes blows me away that one person can do so much in one lifetime! Love reading your stories! As I do, I am missing Colorado. One of these days, I’ll get back there! Karren, this was cool….However, the last 5 photos did not show on my computer, photos for which paragraphs of comments and explanations existed but just little symbols where the photos should have bee. I don’t know if the problem was with my computer or what…. Sorry about the trouble, Carolyn. The pics show up fine on my desktop, phone and iPad. Must be on your side. Try refreshing the screen? Thanks Karren. I understand your thoughts with seeing the grave last. Here you can get planted with a tree. That grows and gives back to the beauty of the area. Currently this is my preference to a grave.